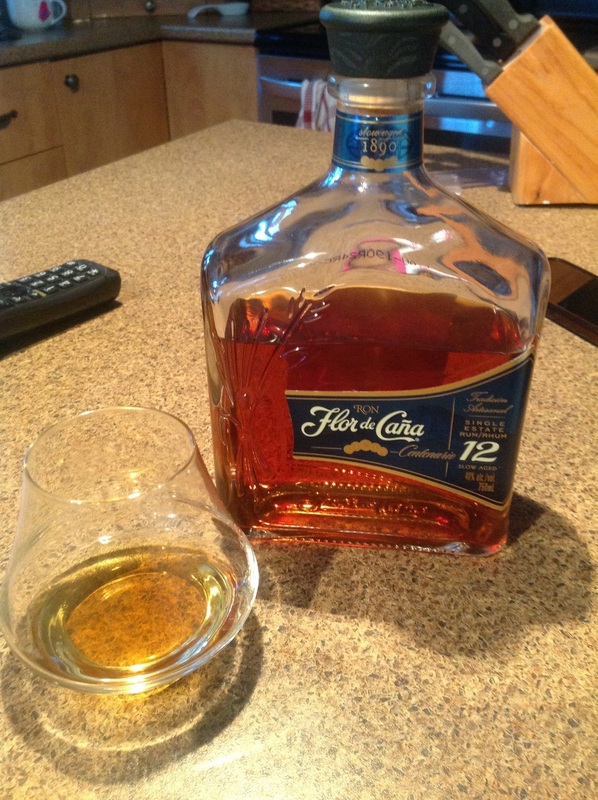 Have you found an online vendor selling Flor de Cana 12-Year? Flor de Caña Centenario 12-Year rum is distilled in a continuous column still process, then rests for 12 years in small American white oak barrels that previously held whiskey and bourbon. Flor de Caña was founded in 1890 by Francisco Alfredo Pellas at the San Antonio Sugar Mill, in Chichigalpa, Nicaragua. The company remains headed by the Pellas family to this day and harvests the molasses and sugarcane used to create their rum from fields adjacent to the distillery in Chichigalpa. SO good, this stuff is. Rich and sweet with enough oak-spice warmly pushing through the flavor profile, most any discerning rum-drinker alive would be happy with this in his/her glass! Neat, on ice, or mixed with Coke or Sprite, this one's a winner on all fronts. Nose: Starts with rum raisins, mahogany and whiffs of diesel fumes. A sharp cloud of alcohol numbs the nose. Then developments of marzipan and modeling clay followed by orange soaked honey and a huge load of nuts such as macadamias, hazel and Brazil nuts. The smell is still sharp even after ten minutes. Mouth: This is new! De Cana has a very delicate sweetness to it which entwines around a heavenly creaminess in the middle register. Very exciting! Unfortunately this is almost lost in the immense alcohol cloud de Cana refuses to let go of. It is troubling to say the least and overshadows nearly everything. Here we have the most appealing rum possible (in a small doze) and it seems to be diluted by vodka. How sad! The nuts are still the main theme with the cream and fine sweetness as passive wingmen. Reaction: I´m thinking older siblings in the Flor de Cana family could be interesting to meet with. The twelve year old feels young and uncertain but the pedigree is there and should be able to produce something more astute. This one feels adolescent, thin and a little cheap which it really isn´t. This version would never be my first choice among the many other tasty friends I have in my cabinet so when do I drink it? This single state rum is one of my favorite from the Flor de Caña range, might be it is not than smoother as a 18 years but I like the balance. The colour is amber and mahogany, the density and legs are good in the glass. In the nose initially you can smell alcohol, with a water spoon opens and the sweetness become, sugar cane of course, the alcohol still present but you can start feeling this balance between the alcohol and the sugar/woody notes, beautiful to drink straight up or in a elegant coctel. The taste is smoother than you can smell, burns just a bit when you keep it in your mount. The medium body, and kinda long finish, you can feel the wood and bitter chocolate in your taste, some sweet notes as well. I general for the price is more than recommended rum, cheers! Nice mellow and warm woody notes. Very rich. Very smooth afterburn. Little dark chocolate and caramel notes. Best rum value ever. I like this rum and it's natural complexity. The flavor can at times have a lot of similarities with good bourbons. A little short of the finish in a way that makes me think it's not aged quite as long as stated, but it's still really smooth and complex nonetheless. Unique tobacco aromas and flavors are apparent and think it offers a great value at it's price point. Less sweet than rums from the Carib - but price point and flavor profile make this just about my favourite sipping rum. More bang for the buck than almost anything. Was expecting more from this. Find it a little harsh for it's age. It's dry, which I like, and the heat dissipates quickly, which keeps it smooth. But, the flavor also disappears too soon, and it's not at all complex. Probably should get a 7.5 rating but I pushed it to 8 because it's a good, honest, no-frills rum. To be honest I don't understand a good rating here. A lot of effort needed to finish this bottle. Not much smell and taste, just alcohol. For its age a big disappointment. I love the Flor de Cana line of rums and the 12 year is no exception. For those of you that enjoy whiskey and bourbon, this is for you. For you rum lovers, you won't be disappointed either. No harsh flavor with limited heat going down. Complex characteristics with a nice contrast of oakiness and sweetness made for sipping neat. I would go with Flor de Cana's younger siblings for mixing with a less expensive price tag. I have edited my previous praising review (in fact erased it). My experiece dated back to the previous incarnation of this rum in its more beautiful rounded bottle. I rated it with a 10, so good it was for me. Palate: Quite sharp and bit alcoholic, oaky, subtle notes of dark chocolate, coffee and caramel and baking spices. Bit too subtle for my taste. Finish: medium, oaky and dry. Quite pleasant. Overall: This type of rum is not for me personally. While it isnt sugared up to destruction like el dorado 12, this rum is just way too subtle tastewise, no dominant flavours except the oakiness.This rum just feels quite flat and also slightly alcoholic. The price was cheap for 12yo rum and presentation and package was maybe the best i have yet seen on a rum bottle so if u get a chance to get the legacy edition of this bottle for cheap, go for it. In der Nase am Anfang sehr leicht, fruchtig und blumig. Jeh länger Er atmet umso mehr gehen die Düfte in die tiefe, gebranntes Karamell, Leder, Tabak, dunkles Holz, Lavagestein. Im Gaumen, kompromisslos ehrlich und ohne Firlefanz. Angenehm jagen die Aromen von unreifen Früchten, Karamell, Vanille und Eichenholz über die Zunge. Jegliche Süsse fehlt. im Abgang, sehr holzig und scharf und doch sehr lieblich. Auch die fruchtigen und blumigen Töne schwingen nach. Ein Ron für Geniesser, finde jedoch diese art von Ron könnte noch ein paar Jahre im Fass lagern, freue mich auf eine Verkostung des 25 yo. Golden amber in the glass. In the nose at the beginning very light, fruity and floral. The longer he breathes the more the scents go into the deep, burned caramel, leather, tobacco, dark wood, lava rock. On the palate, uncompromisingly honest and without frills. The aromas of unripe fruits, caramel, vanilla and oak wood pleasantly haunt the tongue. Any sweetness is missing. On the finish, very woody and spicy and yet very kind. The fruity and floral tones also resonate. A Ron for connoisseurs, but think this kind of Ron could be mature for a few more years in the barrel, looking forward to a tasting of the 25 yo. The palate is drier than expected with medium weight, and some clove, dark chocolate, and dried fruit flavours on a warming, medium-length finish. It is not a great sipping rum, nor does it make a good rum and coke(not enough rum flavour) ,but it is perfect in a rum punch. Was a 6.5 of 10 on my scale, but the more I sampled over time, the more the oak came out and the more I enjoyed. Mild aromas of caramel and vanilla and some oak but not sweet. While FC12 is not as complex as other premium rums I've tried, it is nevertheless a nice "go to" rum. FC12 sells for $38 CAD in my area and for that price, you can't go wrong. UPDATE: The more I try FC12, the more I like it. In addition to the a/n comments, I find that the sweetness of this Rum from the Sugarcane really comes through after a 30 seconds or so, more so than most Rums I've tried. In spite of its affordability, this rum does pretty well as a sipper. I wish we could give 1/2 points in our rating sustem as in my opinion it deserves at least an 8. This rum is somewhat inbetween a sipper and a mixer. Iits good enough for sipping without ice but its not the best at it. It mixes well in drinks but lacks a bit of the punch of its younger siblings. I would get a 7yrs and the 18yrs one for each purpose. Realy good taste. You should try it. Don't suit everyone but I like it. Mi-corsé et plus sec que ce qu'on attendrait, il révèle en bouche des saveurs de clou de girofle, de chocolat noir et de fruits séchés, menant à une finale chaleureuse de longueur moyenne. excellent rapport qualité/prix. This is solid, no frills rum. Not too spicy, a little dry, and not much burn. Short finish and lack of complexity keep it from scoring better. Sugar: 0 gpl. Solid rum for mixing and if you want a sipping rum just add this to some ice and you will be quite happy. Not as smooth as the 18 year old but it is great value for the money here in Ontario. A step up from the 7 year old version. It's a must have in your collection at $40 a bottle. A nice smooth rum, best consumed with an ice cube or two. Nice bottle and the drink has a nice tobacco taste. This us a great sipping rum and any collection should have this or the 18 in their collection. Shrnutí: Pokud někdo u rumů oceňuje jemnost, mohl by být s Flor de Caňou spokojen. Osobně mi jemnost nevadí, pokud se chuť ještě nějakým způsobem vyvíjí, tady se po jemnosti už nic zajímavého neděje. Od 12 let starého rumu očekávám více. Testoval jsem vzorek od kamaráda, kterému jsem tento rum sehnal. Up to the point of trying the FDC 12, my rum purchases had mostly been sweeter rums. So upon first taste, this tasted a bit thin and dry. Many positive reviews encouraged me to be patient, so I did and that patience was rewarded. I've come to enjoy this one and actually find myself thinking of bourbon occasionally as I sip. After having taken a breather from my sweeter rums to get acclimated with the FDC 12, I decided to try the Plantation XO again recently. I couldn't believe how sweet the Plantation tasted! Still love the Plantation but the two rums couldn't be more different. Variety is the spice of life!